Ages ago, I read about Beads of Courage. Its a programme in the States by which a child with a serious illness gets a coloured bead for each medical intervention. They are then threaded chronologically onto a cord and begin to tell the visual story of the journey the child has been on. I thought it was such a great idea – a way to mark it all in is such a celebratory way. The programme is not available to cardiac kids in New Zealand, so I hashed together our own version. I had to cut some corners, especially on the white medication beads (he has had many medications every day), the lime green contact precaution bead (he has been isolated from viruses since forever) and the NG tube insertions or removal (I would say a NG removal, usually accidental and then an insertion would happen on average once every three weeks). I realised I would just have to summarise all of this. 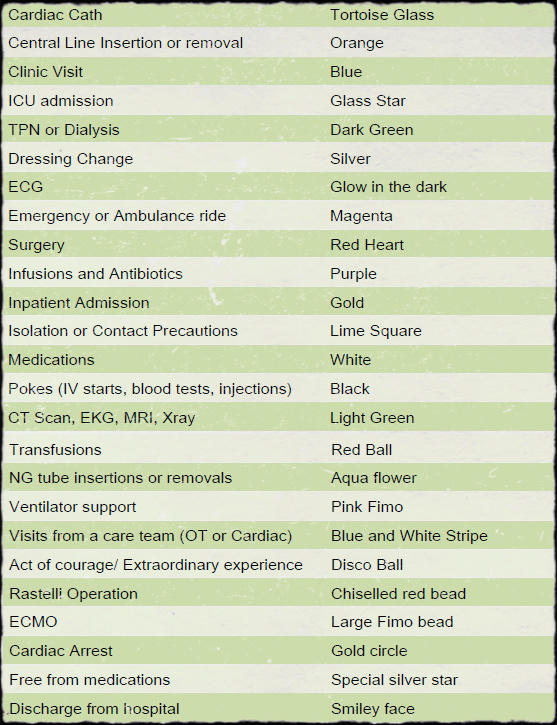 I bought one white bead for every two weeks of medications, one lime green bead for every two weeks of contact precautions etc…. It took a while, an excel spreadsheet, a long jog of memory, a very patient bead store assistant and a very helpful big sister but we got there. 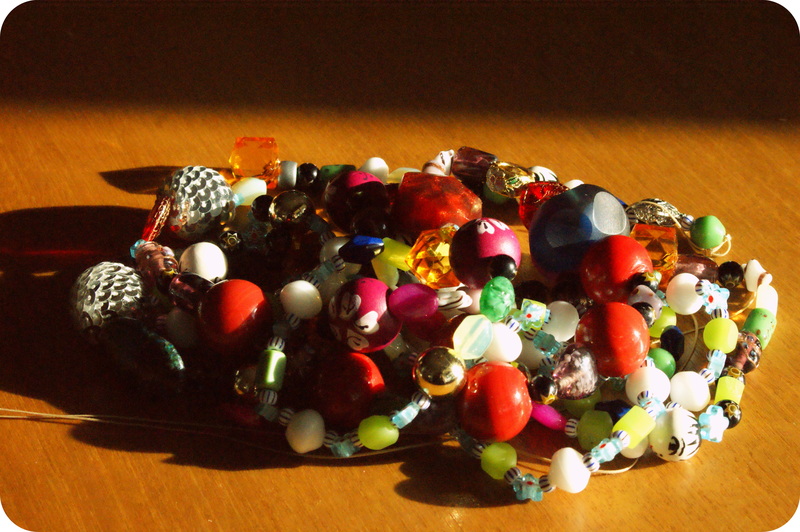 267 beads – and that’s a very, very conservative count. If I had done a bead for each and every medication, iv line and blood test it’d be five times as long at least….. Its about two metres in length. I want to tell you that it is as long as a tiger is, because tigers are brave and it was one of Albie’s first words, but that wouldn’t be factually true. Apparently tigers grow to 3.3 metres (Thanks Wikipedia!). Them cats be long! Anyway, I tigress….. 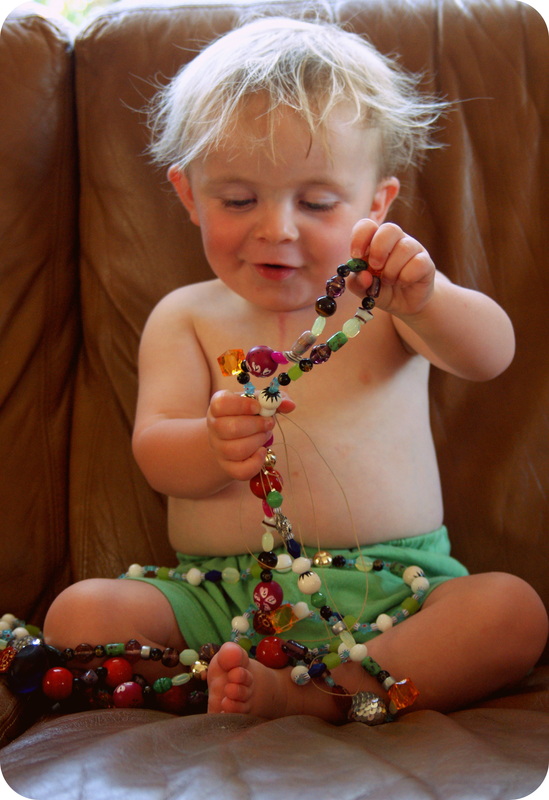 This is Albie looking over the beads, examining them. 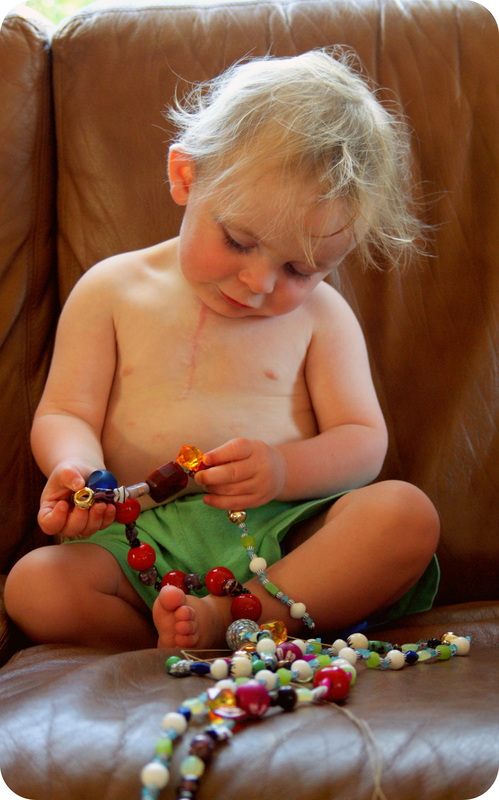 In this photo, his chubby fingers are holding the gold circle bead which represents his cardiac arrest. The circle creates a gap in the necklace just as the arrest created a gap in his life. I see this photo and feel so lucky to be witnessing this boy, in this body, here. They are so beautiful – courage on a string. 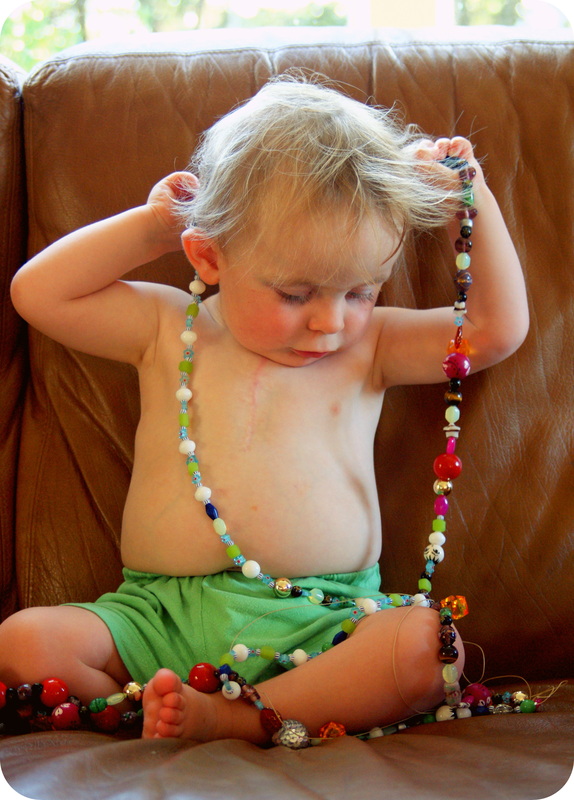 And I can already imagine an eight year old Albie choosing his own beads after a future trip to the hospital. And how very special those moments will be. I can never be excited about the reason for these beads, but I am really happy that in some small way our family can treasure and celebrate together his brave story. PS. Yeah, that’s Albie’s hair after a bath. It has a complete mind of its own. PPS. Jan 2015: This post continues to be one of the most popular on the blog. I highly recommend if you can’t join the Beads of Courage programme that you go ahead and do it yourself. They are a gorgeous visual legacy of the journey you are on, so do it!! I created the chart above drawing from the Beads of Courage programme in the States, and modifying it for Albie’s cardiac condition. It is possibly plagarism. Hopefully, this full admission, and the fact you can’t get the programme in New Zealand anyway means that no-one gives a monkey’s. That is such a great idea, what an amazing way to chronicle his experience! Also, my daughter’s hair is the same only hers is like that almost all the time. Ah toddlers. Sarah and Marcus, I want to wish Albie a happy 2nd birthday and wish him and you health and happiness.